"University of California - Irvine Mesa Court Towers redefines student living"
The nation’s leading design-build association has named UC-Irvine’s Mesa Court student housing towers it’s 2017 Project of the Year. This 250,000 square-foot expansion project includes new residence halls, study rooms, computer labs, great rooms, a fitness center, recreational room, student office space, community kitchenettes and laundry facilities – not to mention a cutting-edge dining facility which redefines the concept of college cafeteria dining. 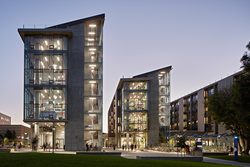 Mesa Court Towers is a dynamic student life hub developed as three five-story midrise residence halls above a large podium containing diverse community spaces for the building’s 884 residents. Shared amenities include flexible classrooms and study rooms, group kitchens, a fitness center, student center and lounges.